Effective January 29, 2007, Innovative put an environmental policy in place. We are the first direct mail and fulfillment provider in Ontario to do so, and hope that other organizations in our industry follow our lead. The policy is the first by a direct marketing agency in Ontario to incorporate environmentally friendly business practices into all service levels. It addresses issues including conserving natural resources, limiting waste generation, reducing energy consumption, reducing harmful emissions, choosing environmentally friendly and cruelty free products, and outlines strict guidelines on reducing, reusing and recycling. 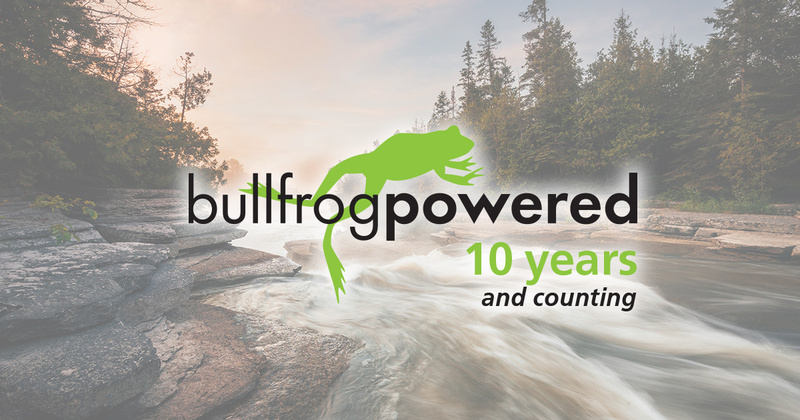 The facility is now bullfrogpowered™ with 100% green electricity. Motion detector lighting, programmable thermostats and energy compliant electronics round out the commitment to reducing electricity throughout the facility. As a matter of fact, based on bullfrog’s calculations, our efforts will reduce Innovative’s emissions by approximately 52.59 tonnes of CO2, 207.07 Kg of SO2 and 44.7Kg of NO in just one year. These emissions are the major contributors of global warming and smog. Wireless technology has been adopted to minimize paper use in the office. We have implemented an internal intranet for all company communications and updates, desktop faxing and a policy to use the backs of scrap paper for rough calculations and notes. Innovative has adopted a strict “NO IDLING” policy for all vehicles visiting our premises. All company collateral and stationery is printed using environmentally friendly paper and vegetable inks. A full recycling program has been implemented that has our team recycle paper, cardboard, glass and plastic. All company events utilize washable dishware, cutlery and other items that replace plastic and foam disposable products. Innovative offers data service upgrades on mailing projects, that reduce waste, and allow our clients to minimize paper, postage and production charges, by ensuring that mailing lists are as accurate as possible. Preference is given to suppliers and trade partners who share our commitment to the environment. Our print network includes several printers who are utilizing FSC and eco-friendly processes, and have their own internal environmental policies in place as well. Our partners can supply either recycled paper or paper from sustainable forests, and use alcohol-free and other chemical-free processes for plate making, proofs and the printing process. We are very proud of the fact that we have taken this initiative, and that our employees strongly support it. Clients who typically use print, direct mail and fulfillment services will now be able to differentiate among service providers based not only on the level of service they provide but on their environmental attributes as well.